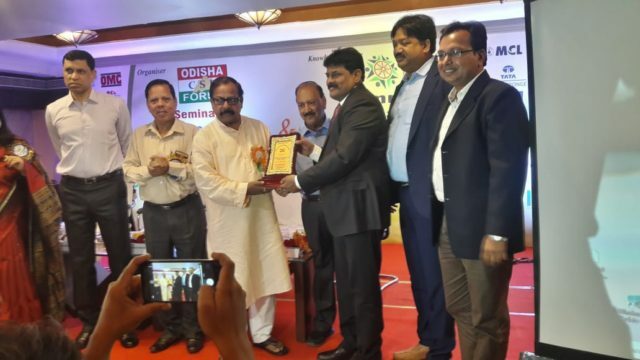 Bhubaneswar: By adding another feather to its cap, the Aditya Birla Group company, Utkal Alumina International Ltd, (UAIL) has been felicitated for its outstanding development work in the peripheral areas of its plant site in Rayagada district. This award has been received by the Unit Head and President of UAIL, Mr N Nagesh from Mr SashiBhusan Behera the Finance and Excise Minister of Govt. of Odisha. UAIL has been awarded in the Best CSR Practices category. This award ceremony has been organised by the Odisha CSR Forum. Among others, the Vice Chancellor of OUAT, Mr S. Puspalak, DIG Police Sh. SudhansuSaranghi, and fromUtkal Alumina, Mr Rakesh Mishra-AVP and Mr Siba Mohapatra, DGM were present in the occasion.